Tribal Sound Healing Retreat in Colombia 2015! After our previous and very successful retreat in Colombia we are getting ready for our 2015 one! many more surprises to come! Dates for 2015 coming up! This 2 week Tribal Sound Healing Retreat will take you on a journey to the second most ecologically diverse country in the world, Colombia! You will be immersed into this beautiful land in different locations with all transport (including local flight to the caribbean coast), accommodation, different workshops and delicious healthy food all included in the price!!. You will be in the heart of the Andean mountains, deserts in the centre of the country and sacred sites and beaches in a paradise with warm, blue seas and a jungle on the caribbean coast, the Heart of the World, the home of the wolrd known and respected Elders The Kogi. *Learn traditional colombian dances & songs *Drumming circles on the beach *Healthy food and fruits! The first week the journey will be in two locations. The first location will be a magical land in the middle of the Andean mountains with warm, wonderful weather, rivers passing by and ceremonial houses, offering everyone an unforgettable life experience as well as being the home for the different workshops, ceremonies and teachings that will be held on this land. Accommodation will be in a wonderful country house with swimming pool with wide views of the green and fresh vegetation of the mountains and surroundings. Healthy food included. The second location will involve a desert that is becoming rich in nature as it has changed into greener lands. This is the land of one of the oldest tribes in Colombia, the 'Muisca'. In this location, of great bio-diversity , you will visit ancient and very sacred sites travelling from the base of the mountains to the top, experiencing everything this beautiful land has to offer. You will be immersed in a unique ecosystem only seen in the High Andes of South America, the Paramo. You will be taken to the ancient lakes where in the diversity of myths from tribes and cultures in Colombia, civilisation was born. Expect to have amazing walks, fire ceremonies and different workshops and activities. You will stay on a beautiful traditional retreat house surrounded by a little river and massive mountains right on the heart of Villa de Leyva, an exhilarating town that you will never forget! as well as visiting different locations in the surroundings. Healthy food included. To begin the second week, you will travel by plane (ticket included) to the caribbean coast in the north of Colombia, one of the most beautiful and sacred beaches in South America. Here you will spend the whole week immersed in wonderful warm,blue seas and white sandy beaches. You will also have the beauty of a very safe jungle, and here you will receive different teachings including dancing, drumming, weaving, musical instrument, making, ceremonies, healing and lots of delicious fresh fruits and food to boost up your soul. Standard accommodation for this location will be in tent (supplied on location) right in front of the sea, but there is an option to have incredible luxury beds and/or rooms to share, with an extra costing added to your demand. This retreat is lead by Colombian Fire Guardian of traditions of the Americas (Amerricua) also Sound Therapist/Practitioner and world music artist, Anthar Kharana who will be sharing different experiences and teachings of the way of sound and ceremony. 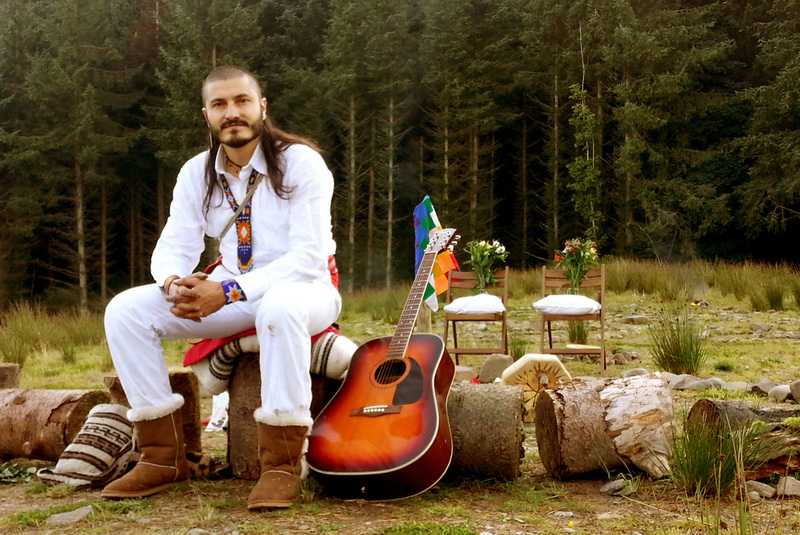 Anthar is also the founder of Tribal Sound Healing in Bristol, United Kingdom, and co-founder of the ANSU School of Sound and Tribal Healing Arts in Scotland. Anthar is also the founder and director of the charity The Tambora Foundation for children in Colombia and the UK. The retreat will be supported by the honourable Elders from different territories in Colombia.They will be sharing their wisdom with us. We will also be joined by professionals and practitioners of different areas of healing, cultural work and permaculture. "The tribal sound retreat provides the perfect medicine for the cosmic traveller. My own medicine was to learn to trust. *Cancellation refunds can only be given after that date if we manage to fill your place. * Online Bank Transfer: account details will be given after registration. This retreat supports the work of Tambora Foundation, preserving ancestral arts and wisdom for children in Colombia and the UK. Many blessings and may this be an opportunity for all of us to unite and enjoy the wonders of nature and sound in depth!